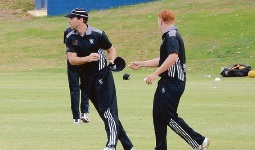 Stewart Walters takes Jack Baker's hat in last years Premier Cricket season. THE 2016-17 Premier Cricket season kicks off this Saturday after a long winter break, with Midland-Guildford beginning its campaign at Sutherlands Park in Gosnells. After finishing eighth on the ladder last year, the team will be hoping to finish in a higher position come finals time in April. A new coach and captain will create an exciting edge to the start of the season at Lilac Hill, with finals now a distinct possibility. Mike Foskett takes up the role of head of coaching, replacing Ross Greer, and Stewart Walters’ focus will switch to coaching, with Christiaan Moir taking over as captain from the reigning Olly Cooley Medallist. A breed of youngsters will begin to move this club forward with Keaton Critchell and Jack Baker at the forefront. Taking 27 wickets last season, Ashley Mucciarone proved to be a revelation and could provide an X-factor to the bowling line up. All-rounder Tim Armstrong looks unlikely to return in a major blow for the club. Without some of its older stars, Midland-Guildford will need an even team contribution for a chance at success.